Happy Friday Eve, ladies! We have another fantastic woman whose story we’re excited to share with you. Her name is Kristen Hansen and she’s the Owner & Lead Planner at Flawless Fêtes. Kristen’s love for planning special occasions started long before she planned her own wedding in the Fall of 2011. The one thing she would change about her wedding day is that she would’ve hired a planner. She realized that having that expert who understood her & what she was looking for and could help tie the whole day together was super important to her. 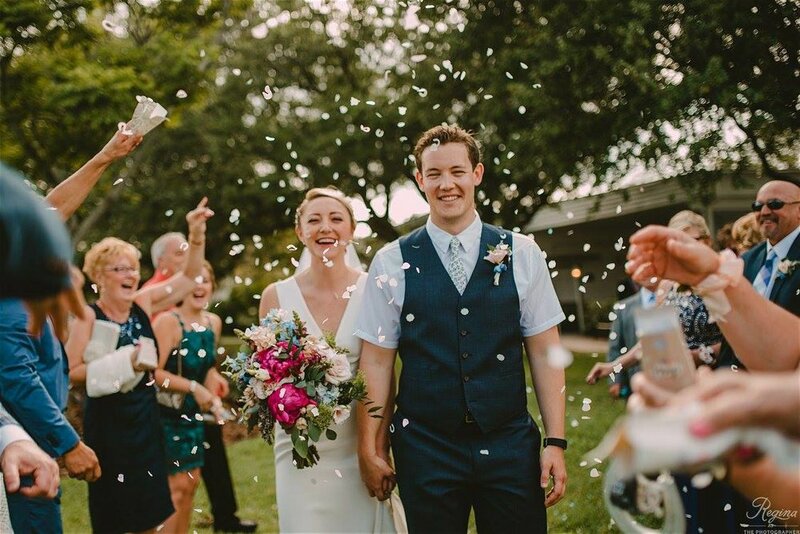 After experiencing a wedding firsthand without one and recognizing how much she enjoyed the planning process, she launched her business less than 6 months later and works tirelessly to create wonderful experiences for each and every bride & groom that comes her way. Hear from Kristen on what advice she has for other small business owners, how to hire the right people for your team, & about the goals she has for her business in 2018. Her candor is helpful & kind. Enjoy her words! Take a peek into Kristen’s daily life! I'm Kristen, a Tampa native, wife to Alex, mom to Xander, dog mom to Scarlett. I come from a really big family and they're the best! I am the owner and principal planner of Flawless Fetes. My team and I plan and coordinate weddings and other events here in the bay area. I couldn't ask for a better job - we get to be a part of the happiest days of people's lives! I'm very "type A" so when I was planning my own wedding in 2011, I went into it with a total 'I got this' mentality. I rode that wave hard until the day of the wedding when I had several people doing several things, all of them friends or relatives who I felt horribly guilty about burdening and realized that what I'd considered kind of a frivolous wedding expense was actually completely imperative and I wanted to be the person to fill that need for people on their wedding days. Flawless Fetes was born just a few short months later and has been full steam ahead ever since! I tell every couple that comes my way, if you don't hire me or my team, please hire SOMEONE. Having a coordinator, at the very least, to keep things running smoothly would be the first thing I'd change about my own wedding and makes all the difference in the world to ensure a stress free day. The biggest challenge I've had has been releasing some of the control I have in my company. I've worked really hard for a long time to build and maintain my professional reputation so finding new team members is daunting. I have to be sure that they'll, of course, be professionals who can gracefully handle high stress wedding days but also that they have personalities and ideals that align with what I want from someone representing myself and my brand. That brings me to my success in having Lindsay and Allison join me. I feel like together we've really fostered a fantastic bond and trust in each other which makes giving our clients a stellar experience that much easier. I can plan something to a tee and have complete faith turning it over that it will be coordinated seamlessly. "Family first" is kind of my tried and true piece of advice. Situations and your relationships with people are going to change over the years but your family will always be there for you. It can feel a lot like all the other stuff is taking priority when you're young or when things get crazy but always making sure that there's a strong home base is key. I'm definitely at my happiest when I'm with my friends and family and we have something to celebrate, whether that be a big event or holiday or just a small accomplishment. It's really special that we're able to come together to get excited about shared traditions or each other's milestones. It doesn't hurt that planning celebrations is kind of my jam. To quote Dita Von Teese - "You can be the ripest, juiciest peach in the world and there's still going to be somebody who hates peaches." Starting and owning your own business is difficult and I hadn't really emotionally prepped myself for the rejection aspect of it. There are times I feel I really clicked with a potential client and don't book the job or I'll hear another vendor has recommended someone else in my field instead of me. It can get to you when you've put your heart and soul into your company, but at the end of the day, you get the work that is the best fit for everyone and in this business the connections definitely matter. I've also had to learn to trust my instincts and maybe walk away from a professional situation that doesn't seem like the best pairing for me and my team. If I have to summarize I would say I'm grateful for support. I have an amazing team backing me that's bigger and better than ever. My family, especially my husband has always been behind me, helping and pitching in whenever I need them. (You can occasionally see Alex doing some heavy lifting at events if I need to bring in the big guns.) My friends are always referring me and several of them have put their trust in me for their own weddings. Last but certainly not least, I have the greatest clients in the biz. Getting positive feedback from people who have hired me and my team is one of my favorite things in the world. A lot of my brides go as far as to recommend me to their friends and family members getting married and it just melts my heart. I've become friends with several of my clients and get to see them have amazing marriages and squeeze their babies years later. It's the best. I'd love to travel a bit more this year. It's tricky with a kid and a business and a husband who works very hard but I'd definitely like to make that a priority. We got to go on several trips in 2017 and it was wonderful! Professionally, I'm very much looking forward to getting Allison settled into her growing role with the company. We've already got our busiest year yet on the books so 2018 will really be about connecting with new vendors and strengthening our bonds as a team! At home in the Heights with my son, probably taking advantage of nap time to squeeze in a few work calls and answer some emails while there's peace and quiet! During wedding season, most likely driving back from a rehearsal, belting the Hamilton cast recording in the car. If it's a post-wedding Sunday, definitely soaking those sore limbs in my bathtub with Kindle in one hand and wine in the other. I love: my big, goofy, ridiculous hodgepodge family! I’m always looking for: unique ways to be a little bit extra. My inspiration is: my couples themselves. It's easy to pigeonhole your aesthetic in this business so it's a deliberate, constant effort put forth to let each pair of people's story speak for itself. I’ll never: say never? Ha ha!